In the seminary we have different stages that a seminarian should undergo. When start his theology he is to be accepted as candidate to priesthood. This is a stage or step that one receives as to show that now is getting closer to priesthood or of becoming a priest. During the later stages of his formation he will also be installed in different ministries. Here at St. John Vianney seminary, when a student reach his second year of theology studies he is installed in these different ministries to prepare him for his pastoral internship that take place during his third year of theology studies. Those different ministries are lector and acolyte. 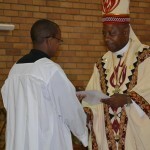 This year as one student (Sepatala Ntefane) of the diocese of Bethlehem I was installed in the ministry of Lectors. 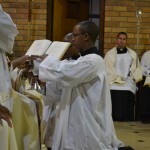 The installation took place at St. John Vianney Seminary, by Bishop Zungu of Port Elizabeth diocese. This event took place on 18 May 2016. It was a moment of taking a step feather. 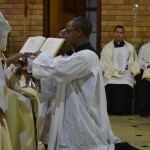 It was a wonderful experience, knowing that one has achieved a certain step in life of priesthood. 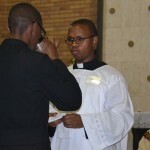 This meant that one is getting closer and closer to his vocation of priesthood. A lector is someone who is made an official proclaimer of God’s word. He is a reader of God’s word and he can even preach or share the word of God. He is installed by his Bishop or by his superior (if he is a religious). The church entrust you to proclaim the word of God. 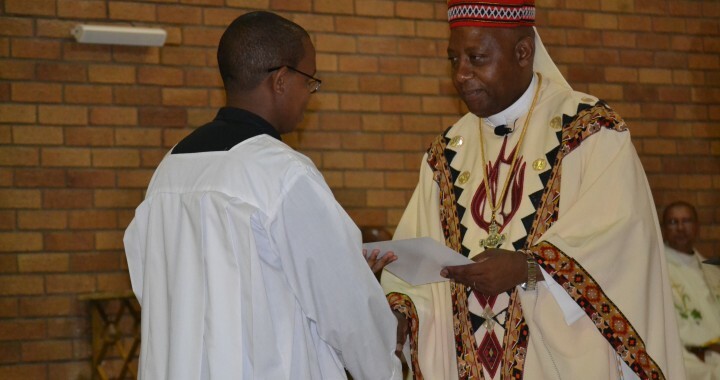 To be installed as a lector, one needs to apply to his Bishop, and as a result Ntefane Sepatala did apply to his bishop (Bishop Jan De Groef) and the reply was positive or was granted a go ahead by his Bishop. This is to show that no one forced you, but you chose it freely and willingly. It is a great joy.